The Sam Holloway Award has been given by the North and East Texas Press Association since 1958, when it was presented to its namesake, Mr. Sam Holloway, at the convention in Tyler. Holloway was one of the founding members of the NETPA in 1926 and served as its second president in 1927. 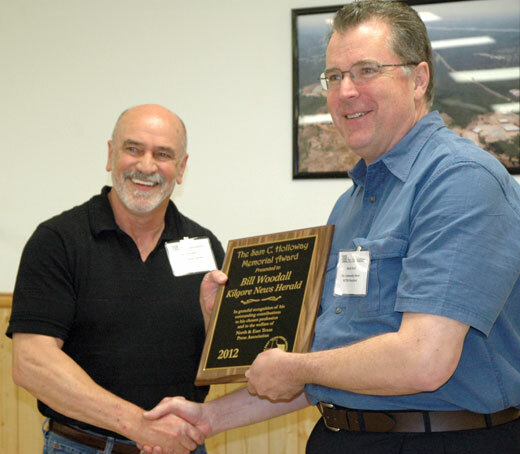 It has been awarded each year since 1958 to an outstanding NETPA member and journalist who has gone above and beyond the call of duty in support of the association while also upholding high standards of journalistic integrity and service to the community. 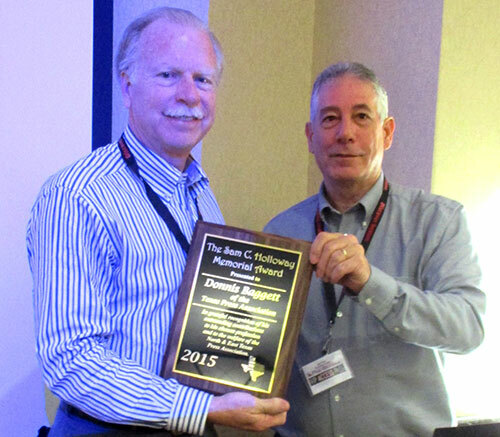 Donnis Baggett (left) of the Texas Press Association being awarded the 2015 Sam C. Holloway Award in Denton. Sam Holloway was born Nov. 23. 1888 in Lancaster, Tex. and married Lucille Stevens in Paris, Tx Feb. 20, 1948. He began his journalism career as a newsboy at the Dallas News and later the Dallas Times-Herald, and learned printing at commercial plants in Dallas and at the Dallas News, where he moved to the editorial department in 1911. He purchased the Deport Times in September 1912 from Claude Council. He established the Talco Times in 1936 after the discovery of oil there, and purchased the Bogata News in 1937. His obituary cites his love of hunting and fishing as his reason for leaving the big city of Dallas for Deport, where he remained until his death May 11, 1960, shortly after this photo was taken in the Deport Times office. His newspaper won numerous awards including best small town weekly at the State Fair of Texas in 1933 and runnerup the following year. In 1926 Holloway, Sam Fryer of Clarksville and Lon Boynton of Paris organized the North and East Texas Press Association. Holloway became its second president in 1927 and was president of the Texas Press Association in 1935. He was awarded the American Legion Distinguished Citizen award in Deport in 1935. He served as president of the Deport Chamber of Commerce, master of the Deport Masonic Lodge (twice) and was a member of chambers of commerce in Bogata, Talco and Lamar County. He was a member of the Dallas chapter of Sigma Delta Chi (Society of Professional Journalists) and a member of the Deport Baptist Church. “Sam Holloway will be greatly missed by his fellow workers and employees, friends and acquaintances, and the area has lost a real newspaper man,” his obituary said. He is remembered in Deport as a typical crusty newspaperman, tight with a dollar but dedicated to his profession and ideals.